The #1 New Years Resolution of 2017 is to Lose Weight | Syringa Inc.
Like many of us you may have made some resolutions to improve your health in 2017. For most of us these resolutions mean losing a few pounds. We know that to lose weight we need to burn more calories than we take in, but there are other things besides diet and exercise that come into play when trying to lose those unwanted pounds. For starters, if you’re estrogen dominant then you’re likely going to find losing weight more difficult. Estrogen helps the body store fat while progesterone helps the body convert fat into energy. Obtaining a balance between these hormones helps the body work more efficiently. Also, stress ups your level of cortisol which makes your body crave sugary foods with lots of fat. And if stress is causing you to lose sleep then your body produces more ghrelin, which is a hormone that makes you feel hungry. Did you know that if you are overweight it can contribute to hormonal imbalance? This is because fat cells produce estrogen. Being significantly overweight can lead to symptoms of estrogen dominance such as excess facial and body hair, retention of water & salt (which can lead bloating and high blood pressure), as well as making PMS and menopausal symptoms even worse. Here is how we can help! 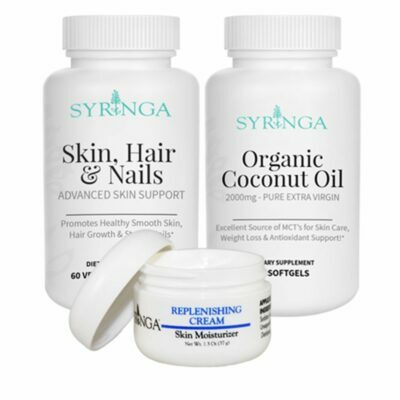 Syringa Natural Supplements are specifically engineered to balance your hormones and keep you feeling great. These are a few products that might be just what you need to keep your 2017 New Years Resolution!